Narain Karthikeyan is many things, an average driver in a poor car mainly, but certainly not an ‘idiot’. 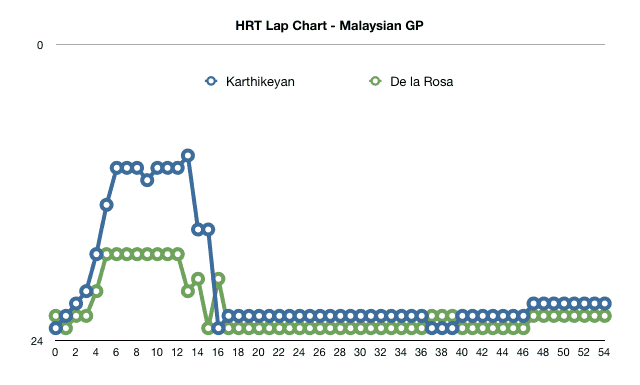 The fallout of the contact between Karthikeyan and Vettel towards the end of the Malaysian Grand Prix has resulted in one of the most unlikely disputes in recent years, in the blue corner, the two time champion of the world Sebastian Vettel, and in the red corner, pay driver Narain Karthikeyan. 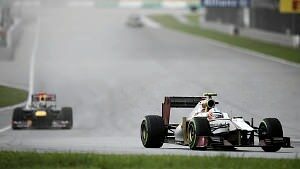 The incident came on lap 48, Karthikeyan, who was being lapped by the quicker cars, was struggling to accelerate on the marbles, allowing those quicker cars past easily. Vettel came steaming past and cut in too early, causing a puncture and effectively ruining any chance of points. Somehow, Karthikeyan was the scapegoat, a 10 place penalty for China means he will be starting last, and Vettel got a chance to say a few choice words in his post-race interview. Like on normal roads, you have some idiots driving around. It seems there is also one driving here. Perhaps a more apt analogy would be comparing Vettel’s Lamborghini trying to overtake Karthikeyan’s 1991 Volkswagen Golf in rainy conditions down the A1, it’s easy to do, but also easy to mess up. In this case, at most, Vettel messed up. It’s worth remembering a similar incident (in slightly drier conditions) at the 2010 Spanish Grand Prix involving former Hispania driver Karun Chandhok and former Toro Rosso driver Jaime Alguersuari. Alguersuari cut in too early when lapping Chandhok. Alguersuari was the driver who suffered a drive through penalty, not Chandhok. It does seem the stewards are being inconsistent with the same rules, and certainly, Alguersuari didn’t seem to argue about it that much. And from that, surely Vettel is similarly an idiot? Wasn’t he the man who drove into the back of Mark Webber under Safety Car conditions at Fuji in 2007. The thing is, the HRT is slow, and that’s to be expected, as are cars struggling to adapt to the conditions on the track, which the HRT painfully was as well. Personally, I don’t blame Karthikeyan, I don’t envy him for having to drive the car and I don’t think he was at all responsible for the crash at all. I wouldn’t like to suggest bias towards the big teams, but, you could argue it looks that way. The HRT’s aren’t a real danger, backmarkers have existed since the dawn of time, and they got themselves in the race through the 107% rule, all by the board and no begging at the knees of the stewards was required. Had the car been so slow that it was dangerous, no doubt the black flag would have been out for Karthikeyan and de la Rosa. Vettel has no grounds to complain, aside from needing someone to blame for struggling in the wet conditions. Racing incidents happen, Button took the blame for his collision with the Indian earlier in the race, Vettel should accept that he can be at fault on occasion, heck, he isn’t perfect. The problem is, HRT are still struggling everywhere. They did get up to 10th using the good old ‘Winkelhock Trick’, of using wet tyres at the start and praying for rain early on, but failed to get anywhere with it, Karthikeyan trickled down the order and ended up laps behind the Caterham and Marussia cars. He was lucky that Pedro de la Rosa was having an even worse race, having problems pretty much everywhere he turned. HRT are, by far, the worst car on the grid, and while the two drivers they have probably aren’t helping them (but survive from going under), it’s unlikely even Vettel could make the car do much better. But they should, and are allowed to be there. Like the backmarkers before them, Minardi, Arrows, whoever, they are capable of driving in a straight line and at a pace which isn’t dangerous, the big teams have to accept they are there, and not be stupid enough to crash into them.